Natasha Karpinskaia is a Russian-born artist, art historian, and educator. She has had numerous solo and group shows both nationally and internationally. 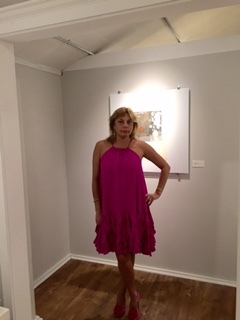 Her works are in many private and some corporate collections in the U.S. and Europe. She was a recipient of a prestigious grant from the Connecticut Commission on the Arts. She has been teaching courses in abstract painting, mixed media, printmaking, and art history at the Silvermine Guild of Art, Pyramid Atlantic in Washington, D.C., and other art centers. She was a professor of art history at the New York Academy of Art. She had also worked as a curator at the Tretyakov Gallery, Moscow, one of the largest museum of Russian art. She received her PhD (ABD) in American art from Columbia University in New York, M.A. from the Academy of Fine Arts in St. Petersburg, Russia, and M.A. from the University of Linguistics in Moscow, Russia.